The owners of the featured bathroom and kitchen projects were so happy with Akril that they went to the store to express their gratitude. Akril is a brilliant decorative sheet which gives the look of glass at a very competitive rate, minus the hassle. It is the new environmentally friendly way to add colour, functionality and durability to your design projects and the result of installation is clean-cut, polished and vibrant. Kitchen and bathroom spaces should be constructed as the most functional and durable rooms of the home. These spaces are susceptible to hair products, creams, spills and stains on a daily basis, and Akril is renowned for being able to handle the wear. The featured bathroom employs ultra-modern bright red sheets of Akril for the shower recesses and white sheets for the wall panels and bath splashbacks, for balance in colour. The client was able to design this 4m x 3m bathroom to their own specifications and it was then professionally installed with ease. As well as being easy to clean, the product is easily workable onsite with normal tools, for example saws and drills, and put together simply by a regular tradesperson. The product’s effectiveness can also been seen in the highly functional kitchen featured. 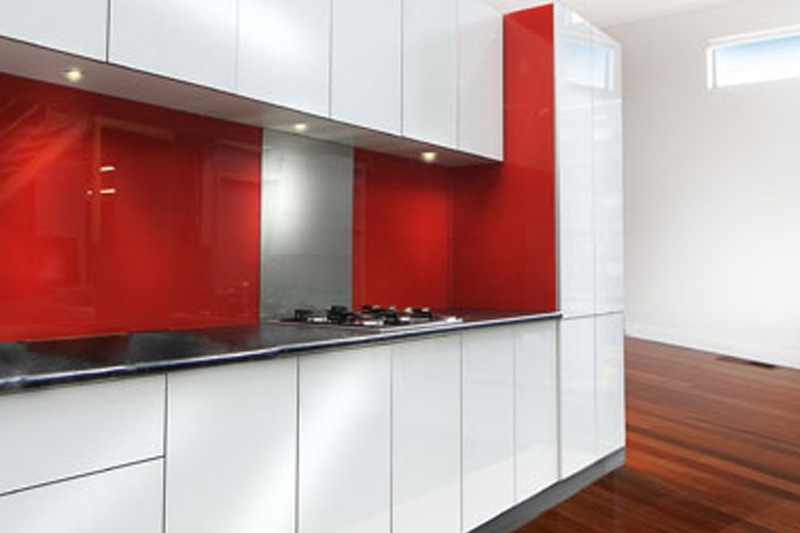 The owners of the 3m x 1m kitchen wanted the look of a glass splashback and wanted to employ high gloss cupboards. Akril’s superior gloss finish and seamless look was able to meet the exacting needs of the client and deliver impeccable results through the doors, splashback and kickboards. The splashback is of the same bright red colour as the shower recesses, while the cabinets are glossy white. Handin- hand with all the benefits that come with using Akril, the owners are able to enjoy a highly modern kitchen that is also timeless. Both the kitchen and bathroom spaces have instantly added value to the owner’s home. Akril is a lightweight, cost effective sheeting solution wonderfully suited to residential, commercial or display situations, and can be fitted to wet areas, decorative panels or any other surface. It is available in three sizes and two thickness options to best suit your needs and the décor of your home. The environmentally friendly engineered polymer is enhanced with colour, offering a range of ten designer colours in a gloss or frosted matt finish. Akril is also able to coordinate colours to your requirements if you have specific needs. Awarded a green star rating by the Good Environmental Choice of Australia (GECA ), Akril offers a source of design inspiration for showers, laundries, kitchen doors, walls and any area of the home or office where direct heat will not be applied. A relatively new product, Akril hit the market only four years ago and has already surpassed the quality of other polymers. It has higher heat distortion (up to 100 degrees Celsius) than other polymers, which means that applications and scratches can easily be polished out. Architects and designers find Akril ideal for renovations because its flexibility, ready availability and efficiency allows for the quickest installation time. This makes the client as happy as the designer. Compared to painted glass, it is half the weight, therefore making for easy installation, and it is 40 per cent more cost effective. So if you love the modern, clean-cut look of glass, Akril is the smartest way to go.